Diana Coleman inspires women to take risks in their second half of life. Sharing stories of women enjoying new experiences, riveting adventures, and making beneficial changes, Diana conducts engaging, motivational presentations. Believing in female fortitude and risk-taking power, Diana Coleman enjoys conducting engaging presentations to motivate others by sharing women’s inspirational stories during the second half of life. 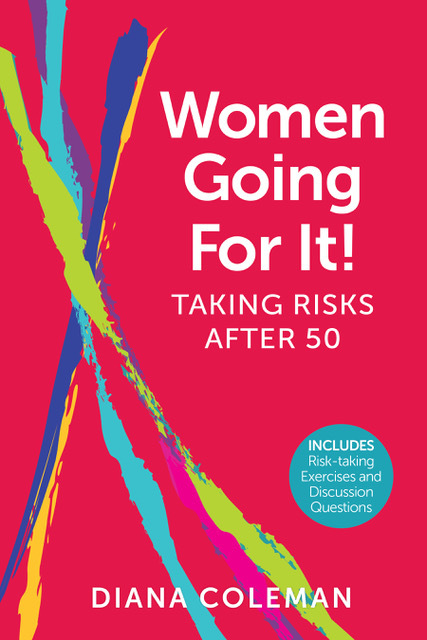 She interviewed many women and documented twenty-six stories of women taking diverse risks for her book Women Going For It! Taking Risks After 50. A former administrator, Diana raised funds for education, health, and microenterprise, for organizations including Save the Children, the University of California, Berkeley, the International Museum of Women, and Pen Bay Healthcare Foundation. An avid and enthusiastic traveler, work and studies have taken her to Central America, Africa, and Asia. She serves on the board of Mpanzi, supporting women and girls in Kenya. Diana has a B.A. from Russell Sage College, and an M.A. from American University. Originally from Massachusetts, she lived thirty years in San Francisco. When not traveling, she resides in Maine. Diana’s travel essays, “Road Trip,” and “Glimpses of Kenya from a Mzungu Woman,” are published in the Goose River Anthology 2017 and 2015.